Review by AllTheBestFights.com: 2018-09-15, pretty good finish between Jan Blachowicz and Nikita Krylov: it gets three stars (UFC Performance of the Night). The black belt in Bjj and former Ksw light-Hw champion Jan Blachowicz entered this fight with a pro mma record of 22-7-0 (59% finishing rate) and he is ranked as the No.10 light heavyweight in the world (currently the #1 in this division is Daniel Cormier). He suffered two consecutive defeats between 2016 and 2017, against Alexander Gustafsson (Gustafsson vs Blachowicz) and Patrick Cummins, but then he has beat Devin Clark (Jan Blachowicz vs Devin Clark), Jared Cannonier and Jimi Manuwa (Jimi Manuwa vs Jan Blachowicz 2). His opponent, the black belt in karate and Fight Nights Global champ Nikita Krylov, has a record of 24-5-0 (100% finishing rate) and he entered as the No.12 in the same weight class. He was defeated by Misha Cirkunov in 2016 but then he has beat Stjepan Bekavac (Nikita Krylov vs Stjepan Bekavac), Maro Perak, Emanuel Newton and Fabio Maldonado (Nikita Krylov vs Fabio Maldonado). Blachowicz vs Krylov is on the undercard of Mark Hunt vs Alexey Oleynik – UFC Fight Night 136. Watch the video and rate this fight! Review by AllTheBestFights.com: 2018-03-17, some good exchanges between Jimi Manuwa and Jan Blachowicz 2 but it is not enough to get three stars: it gets two (UFC Fight of the Night). Jimi Manuwa entered this fight with a pro mma record of 17-3-0 (94% finishing rate) and he is ranked as the No.12 light heavyweight in the world but he comes off the loss against Volkan Oezdemir (Jimi Manuwa vs Volkan Oezdemir). Before this bout he had beat Corey Anderson in 2017 (Manuwa vs Anderson) and Ovince Saint Preux in 2016 (St Preux vs Manuwa). His opponent, the black belt in Bjj and former Ksw light-Hw champion Jan Blachowicz, has a record of 21-7-0 (62% finishing rate) and he entered as the No.25 in the same weight class. He suffered two consecutive defeats between 2016 and 2017, against Alexander Gustafsson (Gustafsson vs Blachowicz) and Patrick Cummins, but then he has beat Devin Clark (Jan Blachowicz vs Devin Clark) and Jared Cannonier. In their first fight Manuwa had defeated Blachowicz via unanimous decision (April 11, 2015 – Jan Blachowicz vs Jimi Manuwa I); this second bout is on the undercard of Fabricio Werdum vs Alexander Volkov – UFC Fight Night 127. Watch the video and rate this fight! Review by AllTheBestFights.com: 2017-10-21, Jan Blachowicz vs Devin Clark gets three stars only thanks to a good finish (UFC Performance of the Night). The former Ksw light-Hw champion Jan Blachowicz entered this fight with a professional record of 19-7-0 (63% finishing rate) and he is ranked as the No.39 light heavyweight in the world but he won just one out of his last five bouts, against Igor Pokrajac in 2016 (=Blachowicz vs Pokrajac). After this fight he has been defeated by Alexander Gustafsson (=Gustafsson vs Blachowicz) and Patrick Cummins. His opponent, Devin Clark, has a mma record of 8-1-0 (50% finishing rate) and he entered as the No.45 in the same weight class. He lost to Alex Nicholson last year but then he has won over Josh Stansbury and Jake Collier. Blachowicz vs Clark is on the undercard of Donald Cerrone vs Darren Till – UFC Fight Night 118. Watch the video and rate this fight! 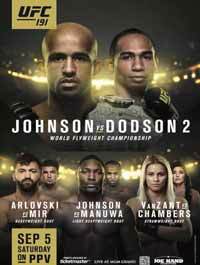 Review by AllTheBestFights.com: 2016-09-03, fight not so exciting between Alexander Gustafsson and Jan Blachowicz: it gets two stars. Alexander Gustafsson entered this fight with a pro mma record of 16-4-0 (81% finishing rate) and he is ranked as the No.6 light heavyweight in the world (currently the #1 in this division is Jon Jones) but he comes off two consecutive defeats, against Anthony Johnson (=Gustafsson vs Johnson) and Daniel Cormier (via split decision, Cormier vs Gustafsson). His opponent, the former KSW light-Hw champion Jan Blachowicz, has a record of 19-5-0 (63% finishing rate) and he entered as the No.31 in the same weight class. He lost two consecutive bouts in 2015, with Jimi Manuwa (=Blachowicz vs Manuwa) and Corey Anderson (=Blachowicz vs Anderson), but he came back to win in 2016 against Igor Pokrajac (=Blachowicz vs Pokrajac). 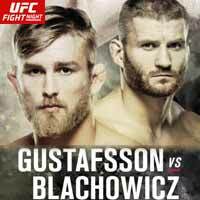 Gustafsson vs Blachowicz is on the undercard of Andrei Arlovski vs Josh Barnett – UFC Fight Night 93. Watch the video and rate this fight! Review by AllTheBestFights.com: 2016-04-10, nice and tough fight between Jan Blachowicz and Igor Pokrajac: it gets three stars. The former Ksw light-Hw champion Jan Blachowicz entered this fight with a professional record of 18-5-0 (67% finishing rate) and he is ranked as the No.29 light heavyweight in the world but he comes off two consecutive losses, against Jimi Manuwa (=Blachowicz vs Manuwa) and Corey Anderson (=Blachowicz vs Anderson). His opponent, Igor Pokrajac, has a mma record of 28-12-0 (86% finishing rate) and he entered as the No.79 in the same weight class. He lost to Marcos Rogerio de Lima in 2014 but then he has won three consecutive fights. 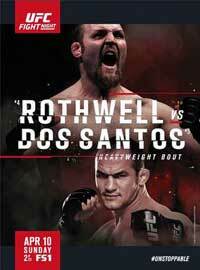 Blachowicz vs Pokrajac is on the undercard of Junior dos Santos vs Ben Rothwell – UFC Fight Night 86. Watch the video and rate this fight! Review: 2014-10-04, fight not particularly exciting between Ilir Latifi and Jan Blachowicz: it gets two stars. Ilir Latifi entered this fight with a mma record of 9-3-0 (78% finishing rate) and he is ranked as the No.20 light heavyweight in the world, he lost his Ufc debut fight in 2013, against Gegard Mousasi (=Mousasi vs Latifi), but he came back to win in 2014 beating Cyrille Diabate and Chris Dempsey. His opponent, Jan Blachowicz, has a record of 17-3-0 (65% finishing rate) but he is not ranked as he hasn’t fought since March 16, 2013 when he defeated Goran Reljic successfully defended his KSW light-Hw title (=Blachowicz vs Reljic). Latifi vs Blachowicz is on the undercard of Gunnar Nelson vs Rick Story – UFC FN 53. Watch the video and rate this fight! Review: 2013-03-16, pretty good fight between Jan Blachowicz and Goran Reljic but it is not enough to get three stars. Jan Blachowicz (16-3-0) entered as the No.25 light heavyweight in the world while Goran Reljic (11-3-0) entered as the No.65. Blachowicz vs Reljic is valid for the KSW light heavyweight championship title (Blachowicz’s second defense); main event of “KSW 22: Pride Time”. Watch the video!